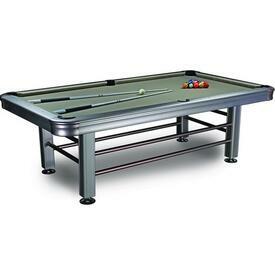 Outdoor billiards and pool tables are on sale at Family Leisure! Find the best game tables at Family Leisure. We are now expanding our offering to include reliable game tables that are perfect for the outdoors. You can find table tennis game tables for the outdoors, and now you'll also find outdoor pool tables. Leisure Select offers consistent quality, with 1'' slate and reliable bumpers and warranties to back up every component. If you are looking for the best outside billiards table, first turn to Family Leisure. We have been in the billiards industry for decades, and we have developed the best relationships with designers and manufacturers of pool tables. Because of this, we are able to offer shoppers the best prices, free shipping, complementary pool table accessories, and installation anywhere in the nation. Browse our selection of outdoor pool tables today!